After you have selected a payment product, you can now proceed to creating a payment service for that product. 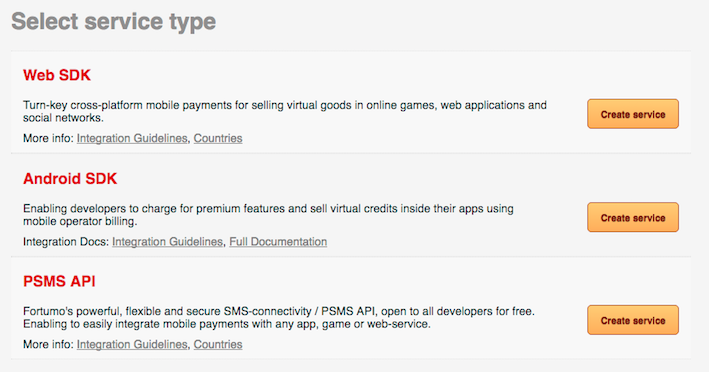 New payment services can be created on Fortumo's Dashboard. subscriptions are available only for single item services. In addition to Fortumo billing solutions this section also includes information on how to use Fortumo's Reporting API, which allows you to automatically fetch revenue report data on regular basis. You can also check out the documentation for our Messaging Platform, in case you want to use Fortumo for messaging.